Upon first landing in Bangkok I was at once relieved and surprised how easy it was to get to my hostel from the airport. The public transport system here is excellent and simple to use. It comprises mainly of the BST (Bangkok Sky Train) and an interlinking Metro line. The Airport Rail Link train also takes you straight from the airport to Bangkok centre and has some great skyline views along the way. Although a lot of the city is full of crazy traffic, busy markets and general mayhem, as soon as you jump on the Sky Train you escape the stress and, more importantly, the heat (the air conditioning is amazing). A lot of people say they find Bangkok overwhelming and not worth staying in for longer than a day, but I personally don’t feel that way. I found the city pretty easy to navigate, and if I ever got lost passers-by would always try to help – or you can jump in the nearest tuk-tuk and let the driver find your destination for you. Besides, travelling by tuk-tuk is a lot of fun (even if there are five people crammed inside one, as on my first night here!). The hardest thing about this city is the heat. I visited just after the hottest part of the year and things were yet to cool down too much. The air’s extremely humid as rainy season is beginning, so you sweat and never quite dry off. Even at night it’s at least 27° Celsius. I cope with the temperature by making sure I don’t have to walk too far and stopping for water/coca cola every couple of hours. If you are heading to Bangkok, be prepared to be sweaty! The main tourist sights of Bangkok are pretty spread out so I decided to try and hit one particular area per day and not try to cover too much ground. 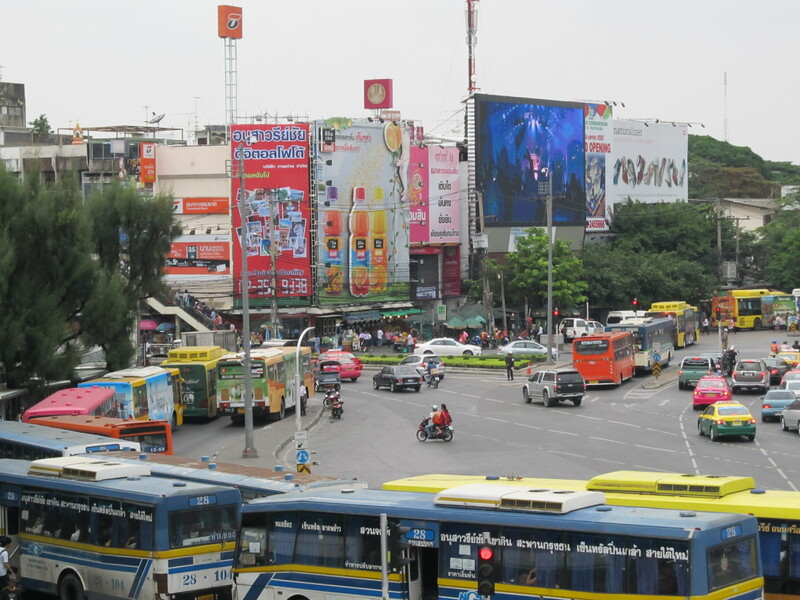 As I was staying in the Silom area I started with the sights around here. I’m heading back to Bangkok at least once before leaving Thailand so I wasn’t in too much of a rush to do everything, thankfully. My first night here I was dragged out by my fellow hostellers to Khao San Road, which is a crazy street just for tourists full of bright lights, bars and street vendors selling tat, to put it simply. I think it’s one of those places that you end up visiting as a tourist but don’t necessarily enjoy. We still had a good time dancing for hours in a club and sharing various buckets of cocktails (yes, they sell alcohol by the bucket here), but it was more to do with the company than the setting. After basically wasting a day recovering from the night out plus jet lag, I made sure my last full day in Bangkok was full of sightseeing. I got up and dumped my bag at the train station ready to catch my sleeper train north later. First I decided to visit an attraction called Jim Thompson’s House (mainly because it was so conveniently located near the trusted Sky Train). Jim Thompson was an American who was largely responsible for the growth of the Thai silk industry in the 20th century, and you can go and look round his old house. Thompson mysteriously disappeared in 1967 while on holiday in Malaysia and nothing is known of what happened to him. As well as being responsible for making Thai silk a worldwide commodity, Thompson was an avid collector of Asian artwork. 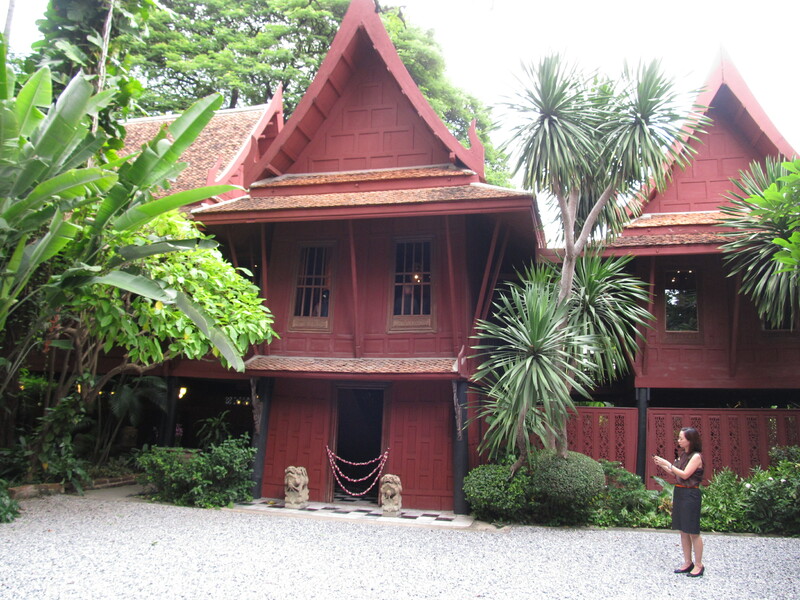 The house itself was imported from various parts of Thailand then put together via Thompson’s specific plans. I didn’t know what to expect from visiting some bloke’s house, but I was pleasantly surprised. A 25 minute tour is included in the admission price (100B) which was informative and interesting. The artwork and furniture in the house is really beautiful and there’s a fair bit to see. I left wishing I could live in a house decorated like that. Next I went to the Snake Farm located in the Silom area. This was a bit more pricey at 200B a ticket, but it is the second biggest snake farm in the world and there are a lot of snake species to see here. I ended up walking around the farm with a friendly Buddhist monk, and we helped each other spotting the snakes – he was much better at finding them! I stayed to watch the snake handling show in the afternoon which was fascinating, although the handlers were a little bold and seemed to have no fear of aggravating these highly venomous reptiles. Apparently one of them had lost a finger to a snake bite, not really surprising! We all got to hold a python at the end which scared me a bit as it hadn’t been fed for ages and was clearly trying to strangle my arm. 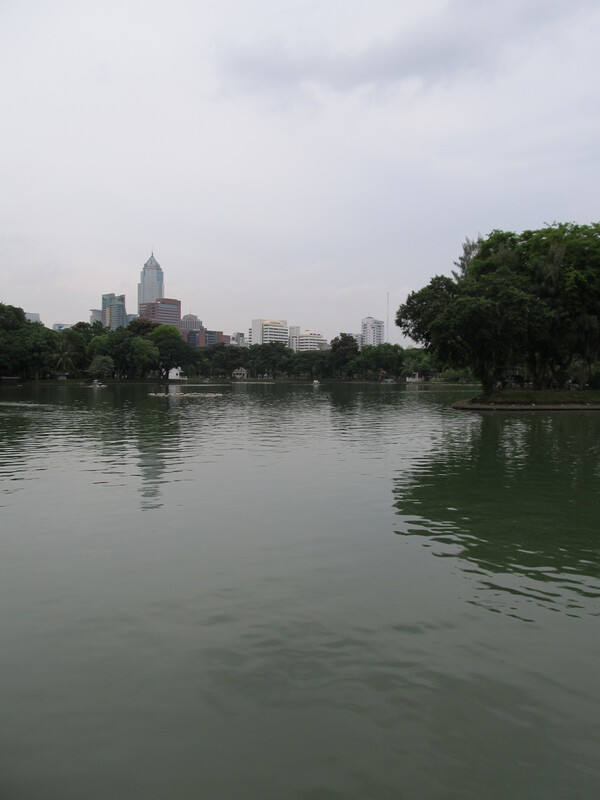 After that I headed to Lumphini Park which is the largest area of greenery in the city. Although parts are pretty I wasn’t overawed by the park, but I was impressed by the Thai locals attempting to jog in the intense heat. The park seems a little tired and not well looked-after. There are some nice views of the city from the lake though, and I did find a sweet family of kittens on a food stall which made me happy. For me Bangkok has been a fascinating and not too stressful introduction to Thailand. I’m already looking forward to exploring it further when I return in a few weeks.